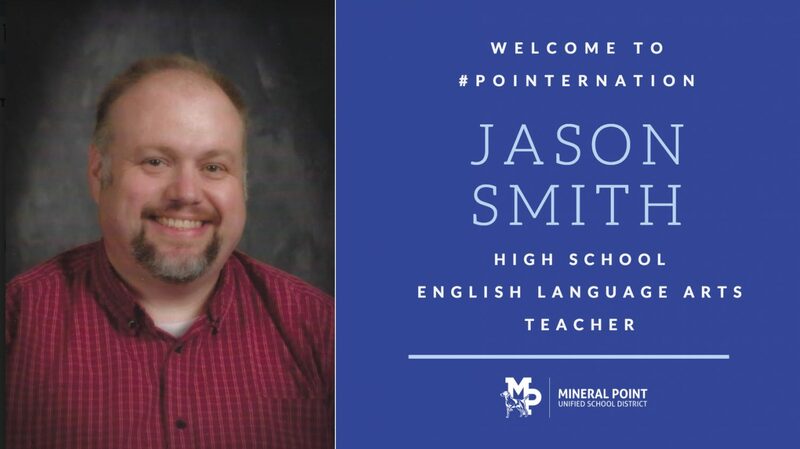 College: Jason earned his Bachelor of Arts in English with an emphasis in Writing from Mesa State College, his Master of Arts in English with an emphasis in Rhetoric/Composition from the University of Northern Colorado, and his Teacher Certification in English from Concordia University. Previous employment: Since the fall of 2011, Jason has been an English Teacher at Lancaster High School. His student teaching was completed at Highland High School and Iowa-Grant Middle School. Hobbies/Free time interests: My wife and I own a camper, and we love using it all summer long with our children and extended family. I am also an avid learner, so I find myself reading and researching instructional best practices that will best support my students. I am always looking to be better tomorrow than I was yesterday. Being a teacher is not just what I do, but it is who I am. What attracted you to apply at MP Schools? Mineral Point Schools is widely recognized as a leader in education. The focus on student learning and pride in school and community is clear in everything that they do. Who wouldn’t want to be a part of that? Quotable: Regarding my teaching philosophy, I believe that all students can learn and that learning best happens in a warm, welcoming, and collaborative environment where student voices are respected, and where they are offered some choice in their learning to nurture personalized success. When assessing student learning, I embrace standards based practices that are aimed at mastery of learning targets. My goal, as a teacher, is to reach every single student, to build a relationship with them, and to help them acquire the skills they will need to be successful and productive in their life, whether they choose college or the workforce. I am 100% student learning focused and want to create learning experiences for students that will last beyond my classroom and into their future. Something that makes me unique is the fact that I hold a Masters degree in English with an emphasis on Rhetoric and Composition; this means that I am able to teach a transcripted credit course through Southwest Technical College and I have been doing so for the last five years. I have developed relationships and networking with my colleagues at the campus as well. I have a deep interest in preparing students for their future with high quality academic experiences in mind, and I recognize the need for students to learn using technology as I believe this is necessary in preparing them for their future careers. I get the greatest pleasure out of the enthusiasm students show when they finally figure something out that they have been struggling with for a while; I live for those moments. I really get excited when I look at student assessment data and see the growth in their skills from where they started to where they are going. I am happy to report that I am living the dream! I am pretty sure that if I won the Mega Millions tomorrow, I would still want to teach; I love it that much.